The media's a-buzz with reports out of Amish country that our "fat genes" can be beaten but that it's gonna take 3-4 hours of activity a day to beat them! They're reporting on a study that 705 Amish who were then investigated for the possession of a gene known to be involved in obesity. The study found that of those folks possessing two copies of the FTO gene, if they were active for 3-4 hours a day they were a whole 15lbs lighter than the least active folks. Basically this study confirms what I've been saying over and over again - the amount of exercise necessary to dramatically affect weight is in an of itself exceedingly dramatic. 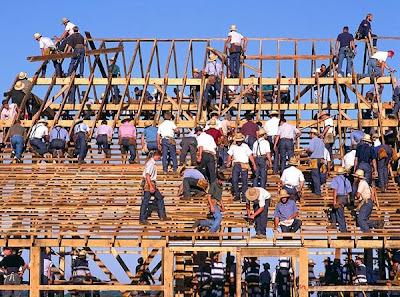 Not really, not even for the Amish, as here we have a study that says even if you exercise 3-4 hours a day more than your sedentary buddy that's only going to make you 15lbs lighter than they are once the barns are built. As always, as far as energy balance goes I'd stack my chips on energy-in.